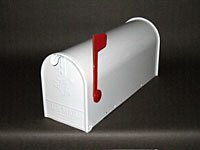 Personalized mailboxes are priced according to lettering and embellishments requested. Mainly requests are for Name/Rank/MOS/Duty Stations/ Vehicles(tanks-airplanes-ships-etc. )/Dates of Service/Units Served In/Personal Medals and Awards/Commemorative Medals/Family Member Names, etc. Additional customization only need be asked for and every effort will be made for accommodation that best represents your service. Also offered are military issue Dog Tags, slotted or regular oval, which can be stamped 15 letters across and five rows down for a great name tag on the front of the mailbox. Or, use the pair that were issued. A Gold Dog Tag or Generic Plate will be standard unless otherwise specified. 99% of request can be accommodated. Please contact Jonathan Field for Design and a Price Quote. The mailbox may be displayed outside, but it is recommended that it be either attached to the house or under the overhang, perhaps the front porch, in your “I Love Me” room, or simply on display in your home. 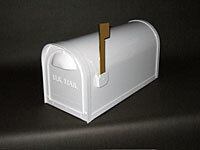 Automotive Clear Coat is applied to all mailboxes.